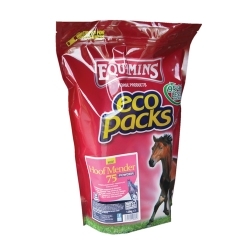 A comprehensive supplement for distressed hooves. Delivering 75mg of Biotin per day, combined with a unique array of bio-available Zinc, essential for strong keratin growth, plus 27 other active ingredients. 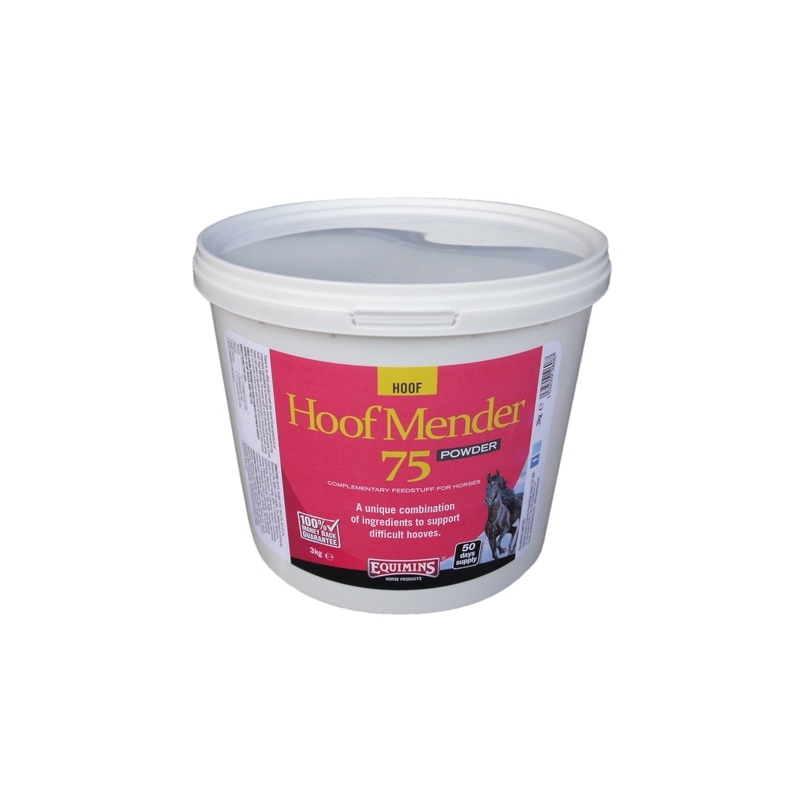 Hoof Mender 75 comes with a full money back warranty. 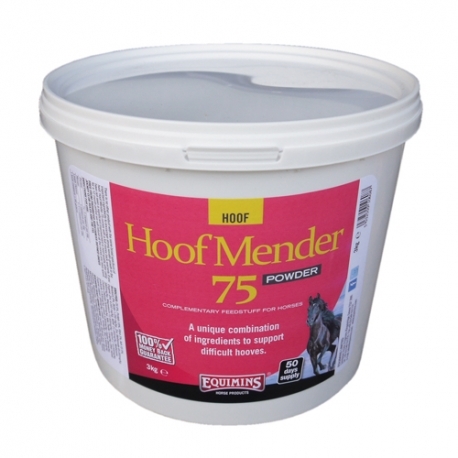 If you feed Hoof Mender 75 to your horse for a twelve month period and you have not seen any improvement in hoof quality, we will refund all of your money. You should keep your receipts as proof of purchase, in the unlikely event you may need to make a claim. We had a haflinger who was prone to getting abscess and chipping his hoof. After he lost a big bit off hoof after a bad abscess we tried him on this powder and it worked a treat, the farrier said it would easily be a year before the hoof had fully grown back down but there was big improvements after 3mths. We now have our tb x dutchwarmblood on this powder as she has typical thoroughbred feet, and it works a treat even with her being barefoot. 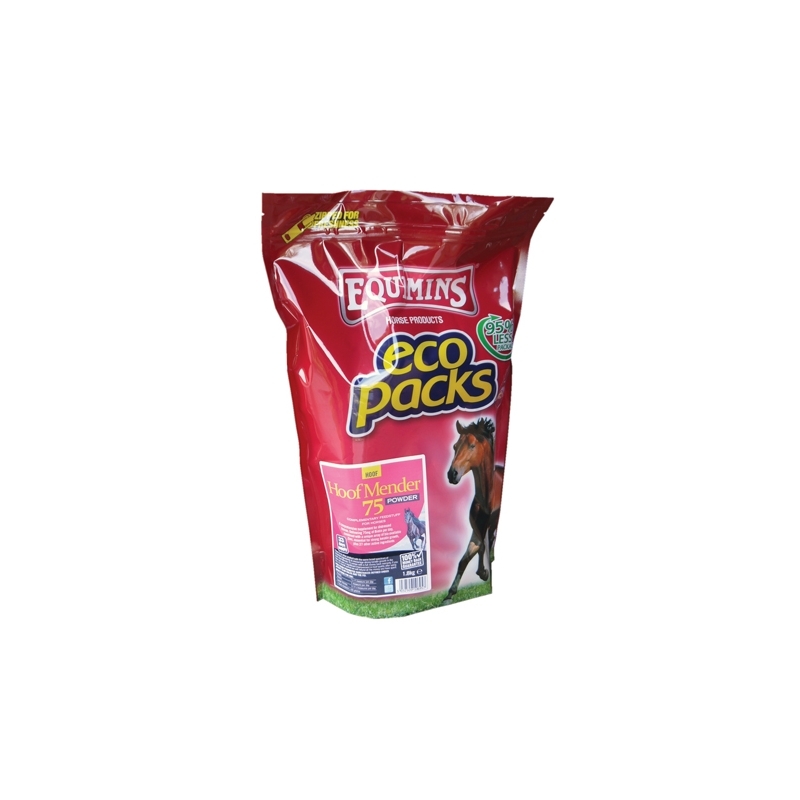 I always recommend equimins hoof powder to friends. I have tried every hoof supplement you can imagine to improve the growth on my horses feet. Its a huge task given he has ringbone, navicular, flat, small feet with bad circulation and MRI scans and x-rays that would make you wonder how he walks! After 15 months on this supplement for the first time ever my farrier (who has shod him since he was 15 months old - now 11 years) says he finally has normal looking feet (on the outside that is!). The feet look the best they have ever looked in his life. I was sceptical that any supplement could help given what it was up against - but I have finally found the one that works for my horse. My barefoot trimmer recommended this supplement for my horse who has shown significant improvement in his feet. Hoofmender. The best biotin supplement there is. Last year you offered my local tack shop 'Victorian Saddles' a free supply of 'Hoof Mender' to give to her farrier that he felt a horse could benefit most from. I took the opportunity as I had just the client. He is a typical thoroughbred with no horn growth, poor quality of horn, weak collapsed heels and no bars. I have shod him for three years, carefully removing his shoes so not to damage the weak wall then rasping away any flair before fitting new shoes, just trying to preserve what little wall he had was a task. We started using Hoof Mender in June last year and after six months this horse is growing vast amounts of horn and of superb quality his heels are strong and is developing bars to support them. If I hadn't experienced it myself I would never had believed it, your product works without any doubt at all, and I have several clients using Hoof Mender and will continue to promote it to other farriers alike. Many thanks for the opportunity to trial your product. Good value product that works. I’ve been using Hoofmender for a couple of months now, with much success. This is a fantastic supplement! Our horse is doing well on Hoof Mender powder. Always use it, getting fab results! Have purchased Hoof Mender before, it works! Micronised Linseed, Calcium Carbonate, Calcium Sulphate, Brewers Yeast, MSM, Sodium Hydrogen Carbonate, Milk Thistle, Magnesium Oxide (Heavy), Silicon Dioxide, Soya Oil, Liquorice Root, Burdock Root, Dandelion Root, Vervain.